In moments, lives were changed. Personal property, mementos, and the routine of daily life for many families was shaken. 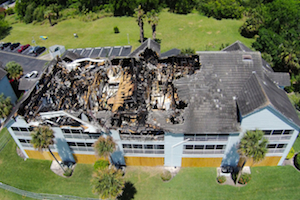 On Thursday, March 27, 2014, a massive fire ripped through the Shadow Woods Condominiums in Titusville, Florida. Fifteen units were destroyed and amazingly no lives were lost. Orange County Construction learned of the two-alarm fire, responded and was able to secure the contract to restore the units. This is what we do! An emergency that no one expects arises and lives are displaced. We focus on cleaning up, boarding up, removing debris, assuring the remnants of smoke, soot and ash are no longer present and begin to rebuild bringing order back to where chaos took over. OCC911.com is proud to be a part of such a task and takes the heart of action and sends our teams in to restore properties such as this and others from unplanned emergencies. The following 18 photos provide you a mere image of what can happen in the blink of an eye. The first stage of the action we take is to secure the property. This is completed with a process known as BOARD UP … whereby wood panels are placed to protect from the elements and from those that might wander to the property without clearance. There remain valuables and the potential to save and restore many items as well as remove smoke damage entirely through a specialized ozone process. We will continue to add further photos as the restoration process and new construction phases are underway to reflect the transition form tragedy to order once again. Check back often. Orange County Construction 911, Inc.
© Copyright 2019 ORANGE COUNTY CONSTRUCTION 911 INC.